Meditation, like any behaviour, is a habit that can be created and changed. To help you do this, we’ve put together some tips and ideas. So take a few minutes, get comfortable and sit with us in this space. Just like heading to the gym or going for a run, meditation is a habit that gets easier over time. This is why we focus on helping people create positive habits around their meditation practice. To do this, we encourage them to view their practice through a habit formation lens and identify the necessary cues, routines and rewards that will help this new, and incredibly beneficial, habit stick. You can create habits? How? By understanding how habits work and how they change. In his very insightful and practical book, The Power of Habits, Charles Duhigg explores the powerful nature of habits and how, for many us, they dictate a lot of our behaviours. Both good and bad. The good are often great: through practice and repetition complex tasks — such as playing the piano, learning how to code or practicing martial arts — can become second nature. The bad are often harmful: smoking, binge drinking and checking Kim Kardashian West’s Instagram account whilst waiting at the counter for your first coffee. For the darker side of habits, a lot of us wish we could “kick them” as easy as Bruce Lee kicks his foe. With The Power of Habits, Duhigg aims to help us do this (kick habits, not foe) by providing relevant examples and practical frameworks*. 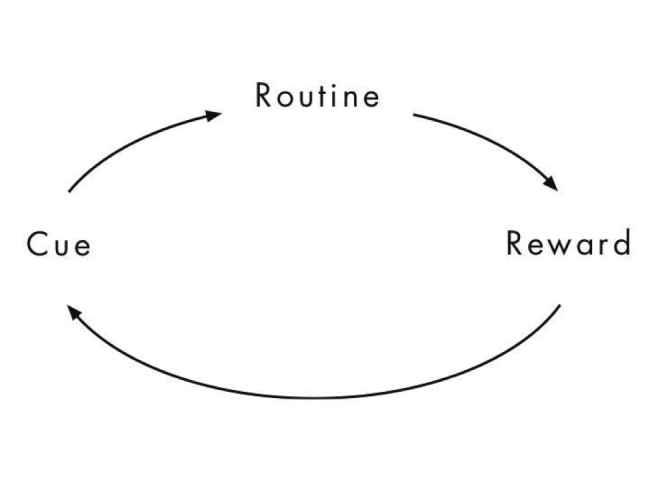 A perfect example of this habit loop in action is the ‘morning coffee ritual’. The cue: Your colleague, Greg, asks you if you want a coffee, which must be a rhetorical question because both yourself and Greg know the answer. The routine: You grab the loose change off your desk, walk to your favourite cafe, order your favourite coffee to-go and discuss the front page of The Age with Greg. The reward: You then receive your very hot and very seasonal coffee with open palms and proceed to sip it slowly and almost intimately on your way back to the office. This gives you that caffeine hit you were craving. You now feel like you can tackle the day. The theory holds that by understanding the parts of this habit loop, we can reconfigure it and change it by adding new cues, routines and/or rewards. Let’s now use this framework to help you turn your daily meditation into a habit. You want to create a habit of meditating for 5 minutes every morning from Monday to Friday. To create this new meditation habit, you’ll need to identify your existing morning routine and figure out where and when you can slot in a new habit. After putting the dishes in the sink and washing the conspicuous yoghurt stains off your black pants, you rush out the door and start chasing the tram. Late again, you tell yourself. If this routine sounds familiar, great! Let’s figure out how we can change your taste in music. And by ‘change your taste in music’, we mean ‘insert a new habit of meditating for 5 minutes in the morning’. Duhigg refers to this step as crucial in creating or redesigning a habit because the reward is what our habit has been consciously or unconsciously designed to achieve. Looking at your routine (that we’ve conveniently designed for you), it seems as though a key desire you’re looking to satisfy in the morning is hunger (step 5). Let’s see how we can use this reward to create a new habit. Once we’ve identified the desire or reward you’re craving (food), we need to create a cue that will set your new meditation habit into motion and eventually lead to the achievement of the reward. Looking at your routine again, the time between getting out of the shower and eating breakfast could be the perfect place to add a new cue, or identify an existing one, as eating food isn’t dependent on getting changed into your work clothes. Running with this hypothesis, we identify an existing cue: putting your pyjamas back on in the bathroom. After step 6 you’d then proceed to feel proud of yourself for meditating 5 minutes more than you did the previous day, make your breakfast and eat it. Now it’s your turn to take this framework and knowledge and create a new habit around your meditation practice. Remember to be patient with yourself. Identifying existing habits and creating new ones isn’t easy. But if you stick with it, the benefits will be profound. Let us know how you go! *Duhigg emphasises there isn’t an “ultimate formula” for habit formation. Like humans, not all habits are cut from the same cloth. Giving up alcohol is very different to stopping yourself from checking Mrs. West’s Instagram account. And the motivations behind each habit is dependent on the individual. What’s important is to view the below frameworks and ideas as tools rather than solutions.